Another in a Series of Effective Weight Loss Tips. Do This One Now. By changing your plate size you can re-program or re-train your stomach where it also counts! 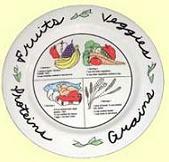 I found this cute web site http://www.healthyplates.com/ that offers really cute smaller plates that labels a spot for fruits, veggies, grains and protein such as the one above. Her is a simple move that can be implemented immediately. Just Do It…(as Nike says). Have you “plateaued” in your Healthy Living (weight loss) Program?Learn how to make a break through! Have you “plateaued” in your Healthy Living (weight loss) Program? Learn how to make a break through! Incorporate high intensity interval training into your routine by doing bursts of high intensity rather than exercising at a single steady pace. Begin your regular workout. Start off at an easy pace, slowly increasing your heart rate for a minimum of 5 minutes. Once you have warmed up, do a high intensity workout. For instance, if you are walking on a treadmill, break into a sprint or a jog, as your high intensity treadmill workout. Do your sprint or jog until you begin to sense a burning sensation in your muscles, as you will get rid of lactic acid and the muscles will lose the ability to contract. After sprinting or jogging, slow it back down, doing a low intensity walk, where you are in the recovery mode and your body’s ability to exchange oxygen and carbon dioxide is enhanced. This delivers nutrients to your muscles. Repeat this process for a minimum of 30 minutes. Cardio is the best interval training weight loss exercises. You can walk and then run for a few minutes. It is simple and easy. Remember that the bursts of intensity should be shorter than the recovery period. Experience a variety of interval training exercises to enhance your Healthy Living (weight loss) Program! Swimming, roller blading, cycling/”spinning”, shooting hoops and running around a basketball court and then slowing down and dribbling the ball are a few ideas to add variety and keep from getting bored with your workout. The key is to have aerobic exercise followed by anaerobic exercise. Eat carbohydrates sparingly, even if they are whole grain. Carbohydrates are rapidly stored as fat. Eat carbohydrates sparingly, even if they are whole grain. Carbohydrates are rapidly stored as fat. Vegetables do have carbohydrates but…remember, when counting carbohydrates in vegetables, the fiber is not counted and can be subtracted from the total. Keep in mind that carrots, beets, peas, winter squashes, parsnips, potatoes, sweet potatoes and corn are the highest in carbohydrates and starch if you are cutting back on carbs! Transform Your Mind, Body and Health in 2017! How would you like to be better in bed? Green Beans in Walnut Vinaigrette…Here is another one for Gary!! :-) Sooo Good!